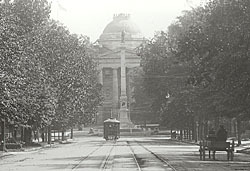 The North Carolina State Capitol, a National Historic Landmark, is located on Capitol Square in the heart of downtown Raleigh. The building is open Monday-Saturday from 9:00am to 5:00pm; closed Sundays and most major state holidays. Please call ahead to confirm hours of operation. Guided tours are offered Saturday at 11:00am and 2:00pm. The grounds are open at all times. Call 919-733-4994 or visit the capitol's website for further information. 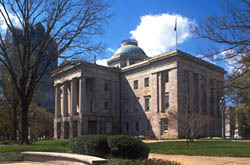 The North Carolina State Capitol has also been documented by the Historic American Buildings Survey. The North Carolina State Capitol is the subject of an online lesson plan produced by Teaching with Historic Places, a National Park Service program that offers classroom-ready lesson plans on properties listed in the National Register. To learn more, visit the Teaching with Historic Places home page.